"The endurance of Shakespeare depends not only on the felt experience of good, vivid theater, but also on dynamic scholarship that reveals his living text." "Timely, original, and beautifully conceived, this is a remarkable edition, one that makes Shakespeare's extraordinary accomplishment more vivid than ever." "The big book is a new one-volume edition of the complete works, commissioned by the Royal Shakespeare Company and published by the Modern Library. 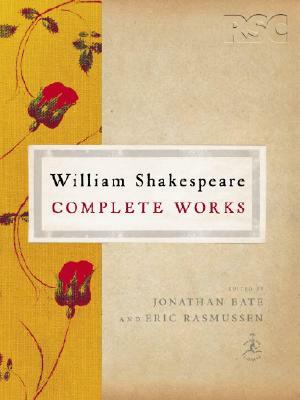 Two eminent Shakespeareans, Jonathan Bate and Eric Rasmussen, have applied modern editing techniques and recent scholarship to correct and update the First Folio, the first collection of the plays, published in 1623…. Mr. Bate writes… a superb introduction that deals with Shakespeare and his world as well as textual questions." "This is a glorious edition of one of the world's most important books. It's the essential reference book for anyone who's ever been in love, felt jealousy, fear, hatred, or desire. All human life is here-and every home should have one." "Thanks to Bate and Rasmussen, we now have a rendering of The Complete Works that, in a rare publishing achievement, would also give complete satisfaction to the author himself." "A new and thoroughly radical edition…. The editorial decisions are argued in an impeccably informative introduction by Jonathan Bate that gives a comprehensive theatrical, social, political and biographical context to the plays. There are pithy essays, also by Bate, to introduce each play as well as exemplary notes at the foot of each page... incomparably useful ... a definitive edition." “A splendid edition. The general introduction is among the best 50-page guides to Shakespeare you could hope to find, while the short essays prefixed to each play are like the best kind of programme notes - informative, thought-provoking and humane.... The RSC's edition tells you all you need to know about the life, but also, vitally, allows you to lose yourself in the wonder of the works."